Top grade quality cowhide motorcycle leather chaps. These motorcycle leather chaps come with braided sides. YKK zippers for easy access through the sides. These motorcycle leather chaps are built to the same standards. The belt buckle has several sizes so you can adjust them accordingly. Measure around the thigh, just below the groin, while keeping the tape horizontal. 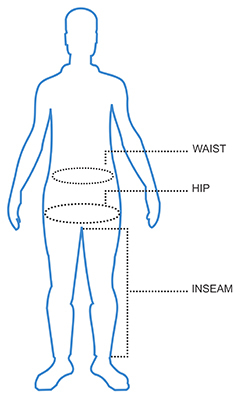 Measure from pant waist binding position to underneath of feet.